The "Z71" package gives the 2015 Chevrolet Colorado a couple nice, shiny "OFF-ROAD" stickers and a few add-ons you can actually use. Here's all the important stuff that comes with the new mid-sized truck in Z71 trim. Automatic locking rear differential: Rear wheels will lock when the truck's computer detects wheel slip, with no driver input. 4.10 axle ratio: Basically, this means the Z71 turns throttle input into power a little more aggressively than the other Colorados. Hill Descent Control: Makes the truck run the brakes automatically to carefully crawl down hills in forward or reverse below 20 MPH. Front recovery hooks: Look cool, makes it a little easier to get yanked out of a bog. 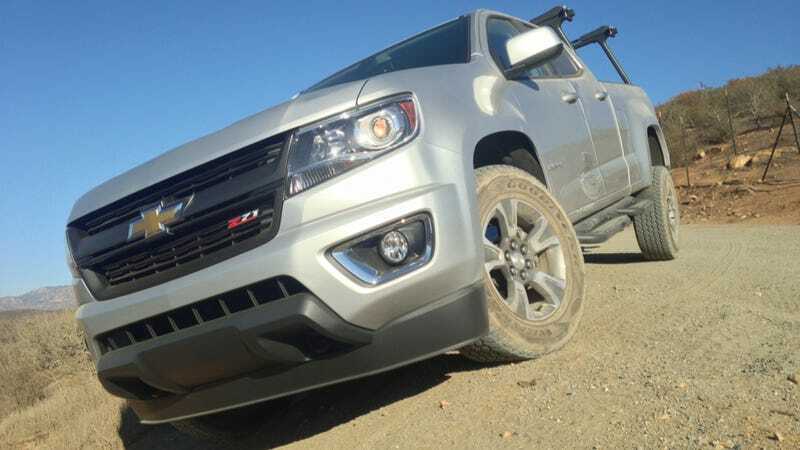 Off-road suspension: All Colorados have coilover front shocks and leaf-springs with shocks in the rear. GM calls the Z71 kit "specially-calibrated twin-tube shocks" over the truck's standard loadout. We're told that translates to slightly softer spring rates for a smoother ride through the bumps. Goodyear Wrangler A/T Adventure tires: Considered "on-road competent, off-road capable." An internal structure with two high-tensile steel belts reinforced by a spirally wrapped layer of Kevlar cord is meant to provide the rigidity needed for strength and leave some room for comfort. Transfer case shield: That would be a shield. Protecting protecting the transfer case: the bucket of gears that splits a 4WD vehicle's power between the front and rear wheels. The base Z71 starts at $31,660, a $2,155 premium over the LT trim below it. The cheapest Colorado is just under $21,000.